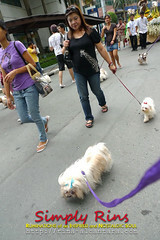 Eastwood City organized a Pet Blessing last Sunday. Owners and their pets flocked the open park just outside of Eastwood Mall to participate in this event. I have been planning to take my sister's dog, Mumay, ever since I found out about the Pet Blessing. 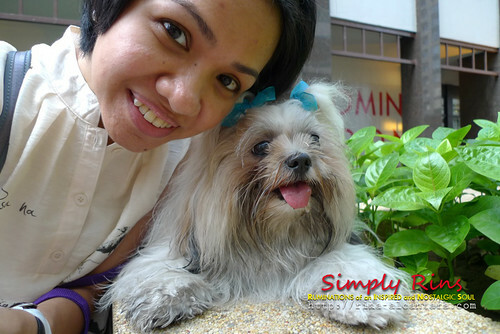 And so, when Sunday arrived, Mumay and I went to Eastwood City. 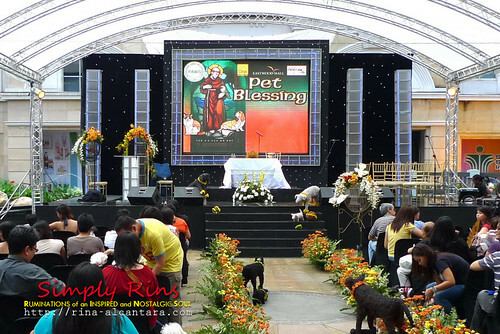 This stage was prepared by Eastwood City for the Pet Blessing. Notice the pets stationed along the aisle and stage? They're not real! I wasn't able to take a closer look but it looks like paper mache. I liked it! 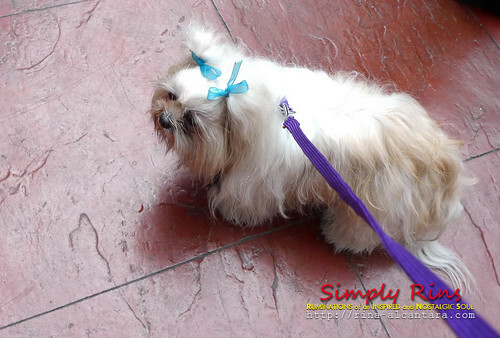 Eastwood City, PAWS (The Philippine Animal Welfare Society), and Pet One annually organize a pet blessing. It would be my first time to attend this event and I found it nice that Eastwood City creates an opportunity for people to bond with their animal companion/s. I don't have a pet I could call my own but my family came to love my sister's dog and I'd like to think of myself as Mumay's nanny since I'm the one who usually takes her out. Mumay's pet pass for the event. We arrived at Eastwood City a little pass 3pm, just in time for the registration. Fortunately, the line was not yet long and we were finished in less than 10 minutes of waiting in line. Mumay and I had at least half an hour to kill before the procession of St. Francis of Assisi's statue at 4pm. Mumay was in a good mood that day so I decided we'd join the procession. This is Mumay while looking at the gorgeous male dogs that came to the pet blessing. 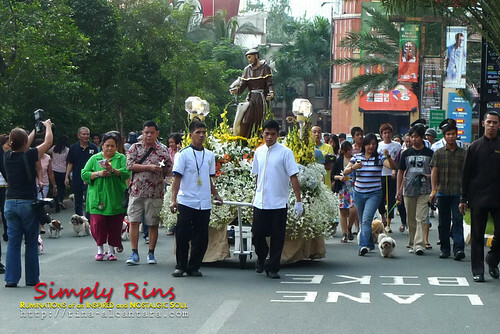 Eastwood City's Pet Blessing is also a celebration of the feast of St. Francis of Assisi. He's known as the patron saint of the environment and animals. His feast day is actually on October 4. However, the nearest Sunday was the best time for most people to be able to go out with their pets. Pet One provided participants with free dog food samples. 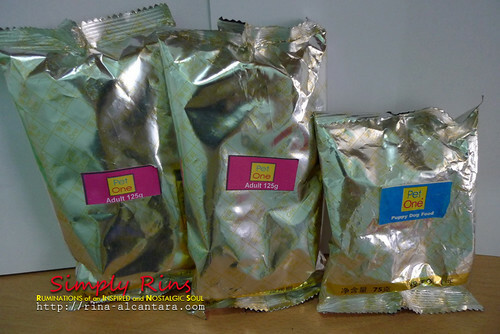 Pet One, Inc. are makers of affordable high quality dog food. They also promote responsible ownership through their My Pet One Club Dog Care On Wheels. The club offers free services for dogs like vaccination, general physical examination, etc. 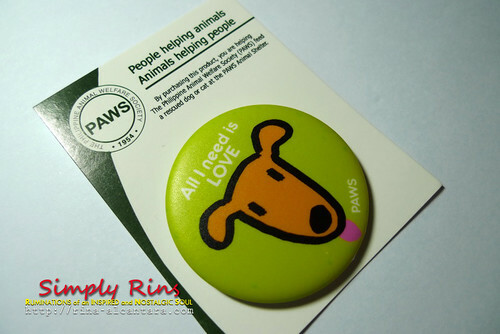 Pet One also created programs such as My Pet One Club and My Vet One Club. A lot of people with their pets joined the procession. It took us approximately an hour to circle Eastwood City. I had to carry Mumay a few times during the procession because she'll just refuse to walk when she gets tired. I'm not complaining. Although it didn't rain last Sunday, people and pets would probably have appreciated a little wind. The photo on the left shows Mumay during the procession. She's usually hyper whenever she's out of the house. She will keep running until it tires her. But during the procession, she just walked along with other dogs. Sometimes she'll jump at me when she wants to be carried. Me and Mumay right after the procession of St. Francis of Assisi's statue. I just had to take a picture of us together. I placed Mumay in a higher area so she could rest a little and drink her water. A special mass for the animals followed around 5pm. Towards the end, pet owners were asked to face their pets and recite a pledge. This moment was quite touching. I can actually hear people reciting the pledge that primarily makes you promise to take care of your pet responsibly and with love. Finally, the priest asked all pet owners to gather around for the pet blessing. Some people raised their pets over their heads. Unfortunately, I couldn't do it for long so I just allowed Mumay to lay down on the ledge she was on. 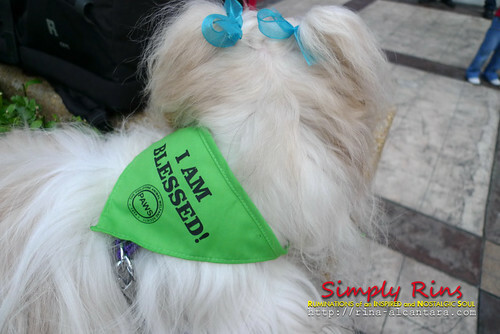 Mumay wore her "I Am Blessed" bandana during the mass. 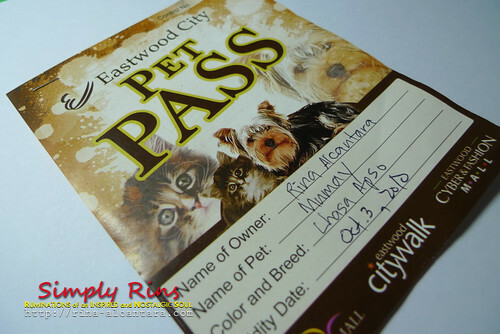 Hopefully, I'd be able to attend next year's Pet Blessing at Eastwood City. I would like to get your permission to use your first photo at the video we're doing for our dogs' first pet blessing event. I'll be sure to credit you if you're okay with it. Nice blog, thanks for sharing the information. I will come to look for update. Keep up the good work. visit our site for take care of your pet. Do you ever think how ppmaranian husky mix looks like?